I know you’ve heard this before: if you are going to drive off-road you should always go out with two or more trucks. 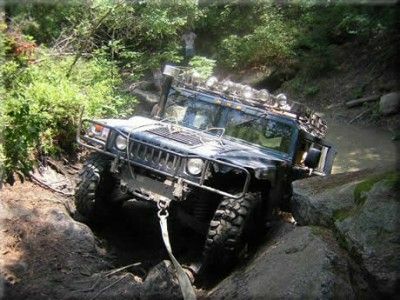 Many Hummer owners are mavericks with little more than a marginal degree of self-control, however-- so the urge to go out on a trail can’t always be curbed. Once in a while, an irresistible and unplanned opportunity to go wheeling presents itself at a time when another truck isn’t around. As a result, a Hummer may occasionally find itself stuck out on the trails alone, and without all the recovery gear one would hope for. Even if you never go wheeling alone, you may run into a time when you can’t get another truck into position to help get you out with a tow strap. Winch cables sometimes break. You may have a working winch and all the right straps and shackles - you may even have every conceivable recovery gadget on the planet. There are still going to be times when getting a vehicle unstuck will require more than a simple tug from a tow strap or hooking up the winch line. These are the times that require plain old-fashioned hard work. Regardless of how you got there, this is when you have to roll up your sleeves (and sometimes your pant legs) and get the truck off the trail. The underside of a Hummer is a broad flat surface that can act like a giant suction cup in the mud. Sometimes the only way to get a truck out is to “break the suction” by shoveling mud out from underneath. When you get stuck in deep mud, rather than standing around pontificating about what the best method is for getting out, just grab a shovel and start digging like a madman. Shovel until your arms feel like they are going to fall off, and then take a quick break. As soon as you are physically able, dig in again. If you can clear the mud away from the front A-arms and start to see some light under the truck, you will find that a truck that couldn’t be dragged out with a tow strap before will usually roll right out with a little tug once that suction is broken. It just takes a lot of digging to get there! A Hi-Lift jack can help pull the underside of the truck free of the suction as well – just make sure you have something broad to use as a base, or the jack will just push down into the mud as you try jacking it up. A Hi-Lift jack is great for getting yourself unstuck when the truck is high centered. When a Hummer gets hung up on its undercarriage, jack up the truck and build up the trail underneath the tires in order to clear the truck’s belly and drive or pull it out. If someone else is jacking up the truck, go find suitable rocks or sturdy logs to toss under or directly in front of the tires to provide some solid ground to roll out on. A sturdy stick or a pipe can also be used as a lever to push a rock into place (or just keep it where it is) as the truck starts to move. It is just as important to bring along the right kind of people as it is to bring along the right kind of recovery gear. Bring a friend who has the right attitude about wheeling and not only will it help you get all the trucks off the trail, but you will have a lot more fun doing it. That’s why my good buddy Crispy is almost always riding shotgun on the trails with me - not only does he know how to drive the truck, spot for others and have a good idea what the truck is capable of, but he is always willing to help anyone on the trail when they need it. As he puts it, “You just do what has to be done to keep everyone rolling, no matter who is stuck.” The more good people on the trail, the better – it always helps to have an extra person to take a shift of digging, sawing, carrying rocks, looking for tools, or whatever else needs to be done. If you know someone is going to be complaining or whining about delays on the trail, or is not up to the task of helping out – leave them at home. Here’s an example of wheeling with “the wrong person” that makes me mad every time I think about it. Two guys, for the purposes of this story we’ll call them Peter and Stuart, hit the trail in their Hummer H1 wagons – just one guy in each truck. Peter, who had just had heart surgery about a year earlier, finds his H1 wagon bogged down in an icy mud pit. His truck has no bead-locks, so as he tries spinning his way out one of his rear tires pops off the bead and immediately takes in chunks of ice and muddy water. Peter wades into the icy mud to remove the wheel to get a spare on. The operation requires jacking up the truck, heavy lifting, shoveling and a lot of time generally getting very wet, dirty and cold. In the meantime, Stuart watches throughout the several hour recovery and repair process from the comfort of the heated cab of his own truck, not even lifting a finger to help move the spare tire into position, or to lift the removed tire into the back of Peter’s truck. Don’t be like Stuart; as Crispy says, “If you aren’t willing to pitch in no matter who’s stuck then you should stay home.”By the way if you ever go on a trail ride with Stuart, do everyone a favor; take out that trusty shovel you always have in your truck and bury him out there somewhere. Just kidding… Or at least, you didn’t get the idea from me, right? You can hope you won’t get stuck – we all do. But you should still be prepared to work hard on every trail ride. Sometimes you are going to need to get dirty and put your back into it to get those trucks back out to pavement. Pack an extra set of clean dry clothes and shoes in a plastic bag, and keep them stashed somewhere in the truck, and buy a sturdy short handled shovel. Get a Hi-Lift jack. Keep these items, as well as any other recovery gear in your truck all the time. There are times when tools like these can save your behind, but they won’t help you if they are at home in your shed. Remember that getting all the trucks back off the trail safely is a big part of the off-road experience, and almost every great wheeling adventure story involves some kind of vehicle recovery or repair in addition to those spectacular views and awesome obstacles. There is a spirit of camaraderie that binds a good group of people together on the trail. Whether it is you who is thanking other folks for their help, or someone else is slapping you on the back and calling you a hero, all that hard work will be worthwhile in the end. So whether it is you that gets stuck or someone else – get to work.